Rodriguez turns 27 this July and is coming into what should be his peak years. It's the ideal time for a player to settle down and find the perfect club for his needs and it just seems highly unlikely that Madrid can offer this. He may get another year in the first team back at the club, certainly, but Perez would just keep signing replacements and challenging his position. Bayern Munich looks like a far better proposition. The player has spoken a great deal about how happy he is in Bavaria and how settled he is off the pitch, which is vitally important. 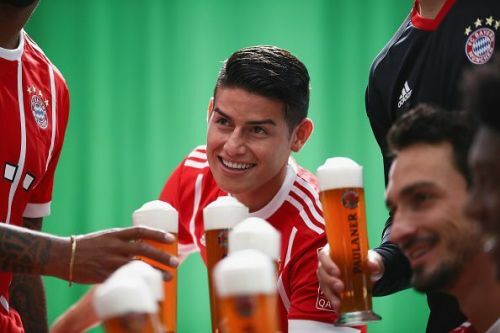 In truth, James never seemed to have the big personality sometimes needed to be a true Galactico; away from the frenetic energy of Madrid life, Munich seems to suit him better and his performances have improved accordingly. Bayern isn't as prone to over-stocking their squad as Madrid, meaning he could be the main star for the club for the foreseeable future. Icons like Arjen Robben and Franck Ribery, both potential competitors, are getting older by the day and tiring, and won't be around for much longer. In his favored position, attacking midfield, he is by far the best option at Bayern, and being one of the main men again may suit the player. He thrived at Porto and Monaco in this role and perhaps the added responsibility is what Rodriguez likes.